For many it is the Ancients range that provides some of the nicest figures and the most appealing accessories. This is perhaps because it was the last of the ranges to be made, appearing during the later 1970s, although the pick of the bunch in our view - the Egyptians - were the first, setting a standard we feel the rest did not quite reach. The range comprised figures and accessories, and we have already reviewed the figure sets from the Atlantic Listing Page. This article completes our coverage of the range by including a look at the often spectacular accessories. These were quite high-price products when they were first released, and many a small child must have awed at the bright, colourful kits on offer at their local model shop. Sadly they disappeared along with the rest of the Atlantic range when that company disappeared during the 1980s, and while some of the figure sets have been re-released, we are not aware that any of these kits have been seen since. Whether the moulds still exist is currently unknown, so for the time being original examples command high prices, especially if unmade, in good condition and still in the box. Atlantic quality was often not what we would expect today, and the focus for the ancients sets was often very confused. All three civilisations covered are represented by figures and accessories that are more in the style of rather than historically accurate depictions of their subject. Each series plays fast and lose with timelines, so we have classical Greek warriors alongside Trojans, Republican legionaries alongside the Colosseum, and Egyptians that are hard to pin down to even an old, middle or new kingdom, never mind a dynasty or year. Of course when they were made they were just toys, and perhaps no child minded if it didn't make much sense. However even they would probably have bemoaned the lack of any opposition for any of the soldiers in this range, and it would take many years before other companies started making opponents such as Hittites, Persians and Celts. Having said all that, the figures and accessories listed on this page still have much going for them, and memories of these old and often now rare toys still stir a warm nostalgic feeling in many an aged small child today. 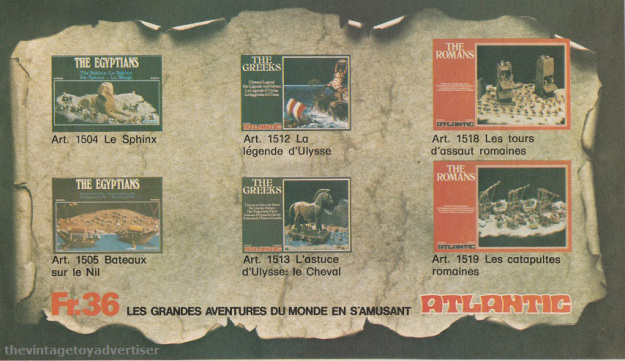 Atlantic made the most of their output, and for their ancients range they packaged the figures in two different sizes of box. For this reason our reviews do not talk about the number of figures in each set, as this will vary depending on the box you buy. Our reviews all mention the larger 1500 series, which had a large colourful box with a flap containing nice photos of the painted figures and some text on the subject inside, and contained four full sprues of the figures. However there was also the 1800 range, which were much smaller boxes containing just one sprue of each set. These were much more basic, and so not quite as collectable today. Because the Roman Cavalry set contains both mounted figures and a full chariot, this was marketed in two separate small boxes (codes 1810 and 1811). The accessories, however, only ever came in one type of box - generally pretty big! So, the full range is listed here. The links for the figure sets bring up the original reviews on those sets, while the rest will take you to pages dedicated to each accessory.